Can anyone recommend any good books or other resources for me to learn more about yeast propagation? Specifically, I’m interested in understanding a little more about predicting yeast quantities resulting from starters. I’ve got a vial of White Labs yeast that is pretty close to its expiration date. The Mr. Malty pitching rate calculator says it’s only about 20% viable at this point. It also shows that even with a starter on a stir plate, I can’t scale this up to a good pitchable quantity without adding another vial. Then I tried the Wyeast calculator, which allows for two-step starters. According to it, I can make a 1 L starter, then add another 1 L and get to the target pitch rate. Curiously, simply doing one 2-L starter doesn’t cut it; it results in 40% fewer yeast cells than doing 1 L plus 1 L. I’d like to understand all this better, and not have to rely on web calculators. The mr. malty calc has a limit to the amount of growth that it will recommend with one starter, that happens to be 6 yeast packages worth. So if it would take over 6 of your 20% viable packages to ferment the batch (6*20=120 billion cells), it jumps up to a new minimum. This isn't particularly useful since most of us don't have two or more identical old yeast packages lying around. The other limit the mr. malty calc places is a minimum starter size of 1L. This is the generally accepted minimum for significant new cell growth in a WL or Wyeast package. You should size each step to remain within the 100-12.5 billion cells/L pitching rate, to ensure timely fermentation and always have the minimum number of cells needed for adequate growth. The closer you stay to the high side of that pitching rate, the more efficient your wort usage will be, at least with a stir plate. You can use the formula on the chart in a spreadsheet to estimate the growth from each step size, and don't forget to add the starting cell count to get the total after each step. 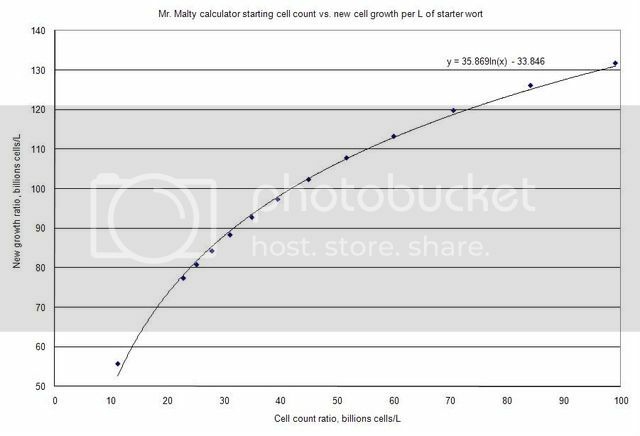 So for example if you have 20 billion cells and pitch at 100 billion cells/L, that's a 200 mL starter * 130 billion new cells/L = 26 billion + 20 billion (starting count) = 46 billion after step one. 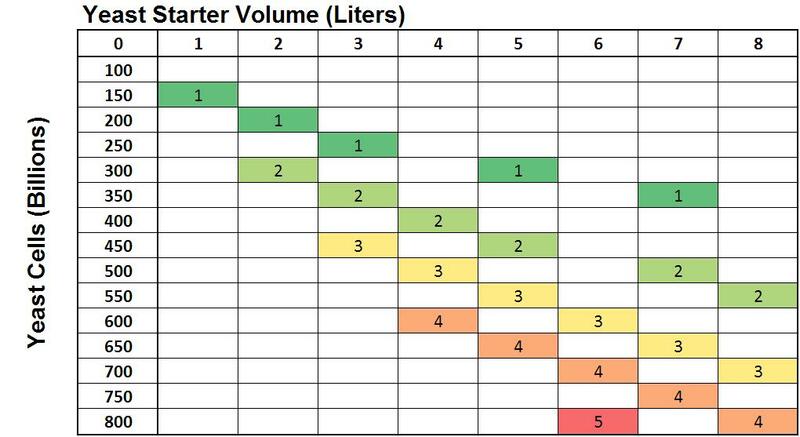 Keeping the same rate for step 2, 46 billion cells into a 460 mL starter * 130 billion new cells/L = 60 billion + 46 billion starting = 106 billion after step 2. You'll have to play with the starter sizes to keep the minimum pitch rate and not grow too many cells for what you need. An alternate method for doing the math above is to have the calculator do it for you. Input your recipe parameters and yeast viability and adjust the volume down until it recommends only 1 yeast package in the starter (remember the smallest it will recommend is 1L, so this is not the most wort-efficient sized starter). The 'cells needed' result is the final cell count in this starter. Next input this number into the viability field and adjust the recipe volume again until you reach either the desired recipe volume or the next step size to keep to 1 yeast package in the starter. You can repeat until your final recipe volume is reached. As your viability exceeds 100%, you need to be cautious that your pitching rate does not exceed 100 billion cells/L (e.g. if the 'cells needed' in a previous step is 150 billion, make sure you make at least a 1.5L starter in the next step. You may need to adjust the intermediate starter sizes to make sure this is the case). An alternate method for doing the math above is to have the calculator do it for you. Input your recipe parameters and yeast viability and adjust the volume down until it recommends only 1 yeast package in the starter (remember the smallest it will recommend is 1L, so this is not the most wort-efficient sized starter). The way I get around that is to use the Wyeast calculator, which will do calculations for any volume (although you have to convert to to and from gallons). this post is old, but serves to resove maybe my question. Without using a calculator, to explain to homebrewers here, I want to know how to get to predict the values (Palmer begins his book, page 69 on a count of 35 billion, but reviewing the amounts that is not according to the manufacturer and ignores% of viality). predicting yeast growth is inherently difficult since there are a number of factors that affect it. One thing I have been keeping track of is the new growth per gram of brewers extract. For a stirred starter this number has mostly been between 1.0 and 1.5 Billion cells per gram of brewer's extract. In the case of 1l of 1040 wort, which contains roughly 100g of brewer's extract, you could expect new growth of about 100-150 Billion cells. This would be lower for starters that are not constantly stirred. BTW, When I compare my data to the chart nyakavat posted, it doesn't match up at all. One data pointy, for example, is a stirred starter of a 10 Plato wort. It started out with ~7 Billion cells / L and ended up to get new growth of ~170 Billion cells / L. According to that chart it should have been way lower. what means of yeast propagation do you have? Can you keep the yeast stirred? for this case I think that intermittent shaking is the most common here.